Win a $500 Shopping Spree to Hudson’s Bay! *Please enter me into the contest. By checking this box, I agree to the contest rules and regulations. 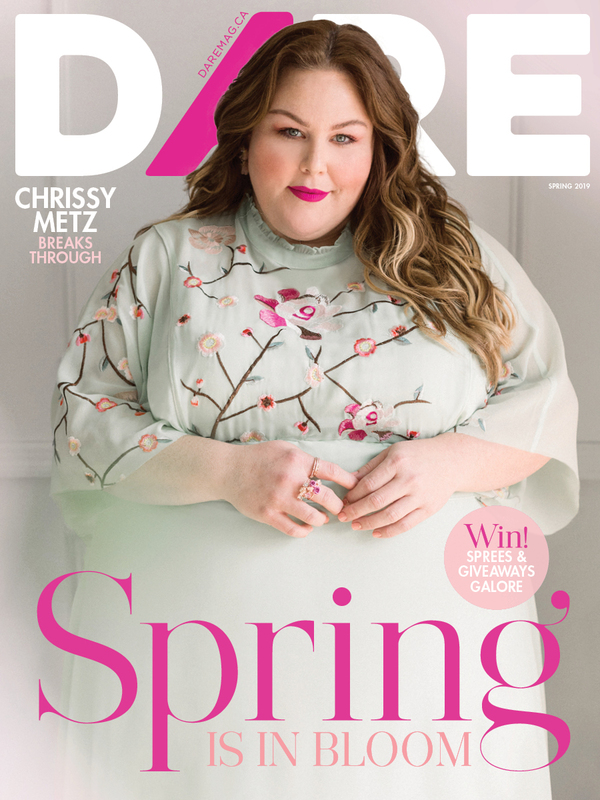 I understand that by entering the contest, I will also be subscribing to DARE Magazine, which is free of charge, and that I can unsubscribe from DARE Magazine at any time. I agree to receive electronic messages from Hudson's Bay Company containing information and offers with respect to products and services that may be of interest to me, including notification of sales, special events and store promotions. I may withdraw this consent at any time by selecting the unsubscribe option. NO PURCHASE OR MONETARY CONSIDERATION IS NECESSARY TO ENTER OR WIN THIS CONTEST. The “Win a $500 Shopping Spree to Hudson’s Bay” (herein referred to as the “Contest”) is hosted by DARE Magazine Inc., 85 East Liberty Street, Toronto, Ontario, Canada M6K3R4. Entry begins at 7:00 AM EST on April 4, 2019 and closes at 11:59 PM EST on April 18, 2019 (“Contest Period”) and is subject to the following general conditions and rules (“Official Rules”). DARE Magazine Inc. sometimes (also referred to herein as the “Contest Host”) shall be responsible for the Contest and its Official Rules. By entering the Contest, all Entrants as defined herein shall be bound by the Official Rules. a. During the Contest Period, participants (herein sometimes referred to as “Entrants”) must go to https://www.daremag.ca/contests/hbc-spring-2019/ and complete all mandatory fields of the online official entry form and click on “submit” for one (1) entry into the Contest (each an “Entry” and collectively the “Entries”). b. To be declared the winner, the entrant must have first correctly answered the mathematical skill-testing question on the entry form. c. Limit of one (1) Entry per person during the Contest Period. d. Any attempt or suspected attempt to submit more than one (1) Entry and/or obtain additional participation than permitted by using multiple email addresses or a pen name, or any use of robotic, automatic, macro, programmed or any other like Entry methods not authorized by these rules shall be deemed as tampering and will void all of said Entries. e. The odds of winning depend on the number of eligible Entries received during the Contest Period. f. By entering the contest, you must accept to subscribe to DARE Magazine, which is free of charge. At any point, you can choose to unsubscribe to DARE. a. The Contest is open to all residents of Canada who have reached the age of majority in their province or territory of residence at the time of entry in to the Contest. b. Employees, representatives and agents of the Contest Host, Hudson’s Bay, or Hudson’s Bay Company, and each of their respective advertising and promotional agencies, affiliated and related companies, prize suppliers and members of their immediate family (parents, children, siblings and spouse, regardless of where they live) and household of such employees are not eligible. • Among all valid Entries one (1) Winner will be drawn at random and will receive the following Prize to be utilized by the Winner: one (1) $500 CAD Shopping Spree to Hudson’s Bay. Total retail prize value is $500 CAD., which will be provided as a gift card. Gift card is valid in stores and at www.thebay.com. The gift card is subject to all terms and conditions imposed by the issuer and can be used to purchase any items at Hudson’s Bay. All Entries must meet the requirements of the Contest and be received within the Contest Period. a. A Winner will be selected among all eligible and compliant Entries received prior to the end of the Contest Period. It shall be done by a random drawing on April 22, 2019 at 12:00PM EST. b. The random drawing will be conducted by a representative of DARE Magazine Inc. at 85 East Liberty Street, Toronto, Ontario, Canada M6K3R4. c. The Winner will be notified by email on or during the week of April 22, 2019.
d. The Winner at his or her sole discretion may disclaim the Prize by not claiming the Prize within fourteen (14) days of attempt notification. e. Non-compliance or the return of any Prize notification as undeliverable may result in disqualification and selection of an alternative Winner. f. For the sake of clarity if a Winner cannot reply within fourteen (14) days of notification, he or she will not be entitled to his/her Prize and another draw will take place to award the Prize. BY ENTERING THE CONTEST, ENTRANTS AGREE TO BE BOUND BY THE DARE MAGAZINE INC. OFFICIAL RULES, AND AGREE TO RELEASE DARE MAGAZINE INC., HUDSON’S BAY, AND HUDSON’S BAY COMPANY, EACH OF THEIR EMPLOYEES, AGENTS AND REPRESENTATIVES, SUBSIDIARIES, AFFILIATED COMPANIES, CONTROLLED CORPORATIONS, ADVERTISING OR PROMOTION AGENCIES, SPONSORS, SUPPLIERS OF MATERIALS, PRIZES AND SERVICES RELATED TO THE CONTEST, OR ANY OTHER PERSON DIRECTLY ASSOCIATED WITH THE HOLDING OF THE CONTEST (“RELEASED PARTIES”) FROM ANY AND ALL LIABILITY WHATSOEVER, FOR LOSSES OR DAMAGES OF ANY KIND THAT RESULT FROM ACCEPTANCE, POSSESSION OR USE OF ANY PRIZE OR FROM THE ENTRY OR THE ATTEMPTED ENTRY IN THE CONTEST. THE RELEASED PARTIES ASSUME NO LIABILITY FOR LOST OR MISDIRECTED ENTRIES, WHETHER DUE TO TECHNICAL OR COMPUTER MALFUNCTIONS OR OTHERWISE OR ANY OTHER TECHNICAL OR COMPUTER MALFUNCTIONS, FRAUD, OR OTHER ERRORS. DARE MAGAZINE INC. RESERVES THE RIGHT, IN ITS SOLE DISCRETION BUT WITH THE APPROVAL OF THE REGIÉ DES ALCOOLS DES COURSES, ET DES JEUX IN QUEBEC, TO CANCEL, TERMINATE OR SUSPEND THE CONTEST IN ITS ENTIRETY, IN THE EVENT THAT THE WEBSITE IS INFECTED BY A VIRUS, A SOFTWARE BUG, THE WEBSITE IS HACKED, UNAUTHORIZED HUMAN INTERVENTION OCCURS OR THE INTEGRITY, ADMINISTRATION, IMPARTIALITY OR NORMAL OPERATION OF THE CONTEST IS COMPROMISED IN ANY WAY WHATSOEVER. BY ENTERING THIS CONTEST, ENTRANT IS SUBSCRIBING TO DARE MAGAZINE’S NEWSLETTER. NONE OF YOUR PERSONAL INFORMATION WILL EVER BE SHARED, RENTED, SOLD OR OTHERWISE RELEASED TO ANY THIRD PARTY BY DARE MAGAZINE. THIS CONTEST IS IN NO WAY SPONSORED, ENDORSED OR ADMINISTERED BY, OR ASSOCIATED WITH, FACEBOOK. THE CONTEST HOST HEREBY RELEASES FACEBOOK OF ANY LIABILITY. a. Entrants, by entering the Contest, agree to abide by the Official Rules, and agree that the decisions of DARE Magazine Inc. are final and without appeal with respect to all aspects of the Contest including, without limitation, the eligibility and/or the disqualification of Entries. b. All Entries are subject to audit by of DARE Magazine Inc. Any Entry that is incomplete, fraudulent, copied, received late, discriminatory, defamatory, offensive, obscene, vulgar or against good morals or prejudicial to DARE Magazine Inc., its subsidiaries, affiliated companies, parent corporations, its employees, agents, representatives, directors and officers, its advertising and promotion agencies or any other person related in any manner whatsoever to DARE Magazine Inc. will automatically be rejected and will not be eligible for the Prize. c. DARE Magazine Inc. is not responsible for any changes or effects caused by or to the Entrant’s computer system as a result of submitting electronic Entries. d. All Entries are the property of DARE Magazine Inc. No responsibility will be taken for Entries lost, delayed, incomplete, damaged, stolen, undelivered or misdirected, all of which are void, or that cannot be processed due to phone, network, electronic, or computer hardware or software failure, or technical failures of any kind. e. By entering this Contest, Entrants agree to release, discharge and hold harmless the Released Parties from any and all liability for any injury, loss or damage of any kind to persons, including death, and property, whether direct or indirect, which may be due or arise out of participation in the Contest or any portion thereof, or the acceptance, use/misuse or possession of prizes, or any prize-related travel or activity. f. Any prize is non-exchangeable, non-transferable, non-refundable, has no cash-surrender value, and must be accepted as awarded with no substitutions. Hudson’s Bay and the Contest Host reserve the right, in their sole discretion, to substitute and/or modify any prize with (a) prize(s) of equal or greater value for any reason. g. Any tax implications that may arise from winning the Prize are the responsibility of the Winner and he or she should seek independent financial advice prior to acceptance of his/her Prize. h. Subject to applicable law and the approval of the Regié Des Alcools Des Courses, Et Des Jeux In Quebec, DARE Magazine Inc. reserves the right to terminate or withdraw this Contest at any time, for any reason whatsoever. i. This Contest is subject to all federal, provincial and municipal laws and regulation. j. If any provision in the Official Rules herein is found by a court of competent jurisdiction to be illegal, unenforceable or void, then such provision will be null and void however all other provisions herein shall remain valid and enforceable to the full extent permitted by law. When entering the Contest, the Entrant agrees that his or her personal information collected by DARE Magazine Inc. (“Personal Information”) shall be used in accordance with applicable law in order for DARE Magazine Inc. or its agents to contact the Entrants for the purposes of the Contest. In compliance with the Personal Data Protection Legislation in force, Entrants expressly consent the incorporation of their Personal Information into DARE Magazine Inc.’s database and its treatment for the purposes hereof. DARE Magazine Inc. has adopted the technical and organizational measures necessary to ensure the security of Personal Information and to prevent their alteration, loss, unauthorized processing or access. At any time you may revoke your consent and exercise your rights of objection, access, rectification and cancellation by addressing our Compliance Officer. You may obtain any information about the Contest such as the name of the Winner, or a copy of the Official Rules or for any complaints also at 85 East Liberty Street, Toronto, Ontario, Canada M6K3R4. Provision of personal data to Hudson’s Bay: If an Entrant checks the applicable box on the entry form for this Contest, the entrant agrees to receive electronic messages from Hudson’s Bay Company containing information and offers with respect to products and services that may be of interest to them, including notification of sales, special events and store promotions. Such Entrants may withdraw their consent at any time by selecting the unsubscribe option within such electronic messages. a. For Quebec Residents: Any litigation respecting the conduct or organization of a publicity contest may be submitted to the Régie des alcools, des courses et des jeux for a ruling. Any litigation respecting the awarding of a prize may be submitted to the board only for the purpose of helping the parties reach a settlement.